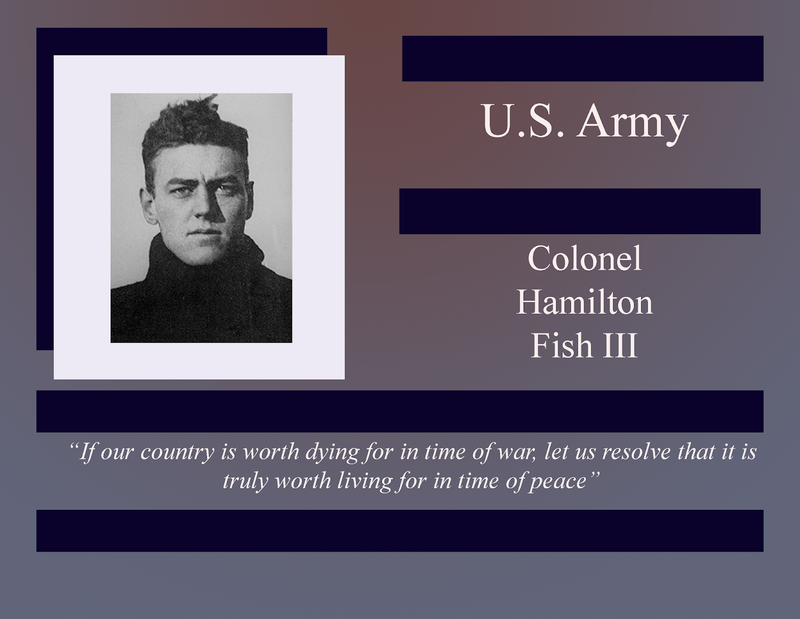 Colonel Hamilton Stuyvesant Fish III was born on December 7, 1888, in Garrison, New York. From a wealthy family, his education was mostly private boarding schools, including the Swiss academy Chateau de Lancy. Colonel Fish graduated from St. Mark's Academy in 1906. Colonel Fish was a natural athlete, playing soccer and football. At 6'4" he was accepted onto the Harvard Football team during his college years. He was twice on the all American team. 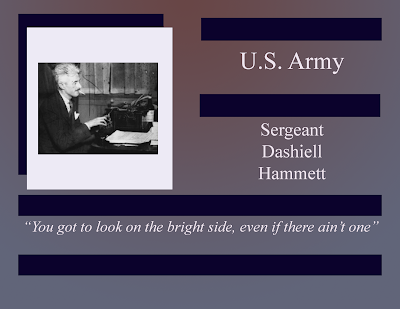 Graduating from Harvard in 1909 with a degree in history and government, Colonel Fish initially started Harvard Law School before leaving to work for an insurance company in New York City. He was elected as a member of the New York State Assembly 1914-1916. Colonel Fish was also a member of the NY National Guard and commanded (as a captain) K Company of the 15th NY Infantry (the famous "Harlem Hellfighters"), and mustered with them to the 369th Infantry. His unit spent a whopping 191 days in the trenches, where he was elevated to the rank of major before leaving the regular army on May 14, 1919. He remained with the NY National Guard until 1940, during which time he obtained the rank of colonel. 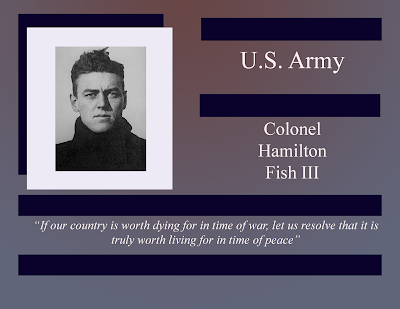 Colonel Fish was elected into the US House of Representatives where he served from November 2, 1920, until January 3, 1945, where he introduced the resolution 67 on December 21, 1920, which provided for the Tomb of the Unknown Soldier at Arlington. After his time in Congress, he wrote five books, including FDR: The Other Side of the Coin and Hamilton Fish: Memoir of a Patriot. In 1958 he also founded the Order of Lafayette. 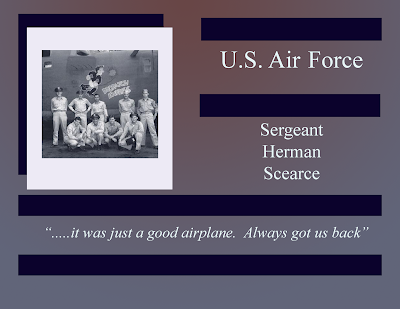 He died on January 18, 1991 - at 102 years of age, in Cold Springs, New York. 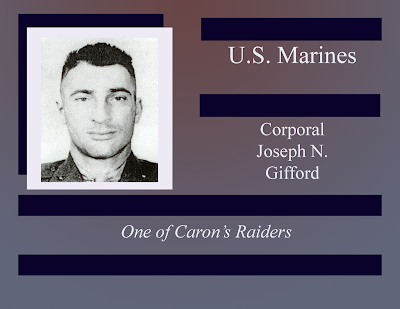 He lived long enough to see a fully integrated military, which had always been one of his strongest causes.